Part guide, part rant, this audiobook will shake you into facing the realities of self-publishing to make money. 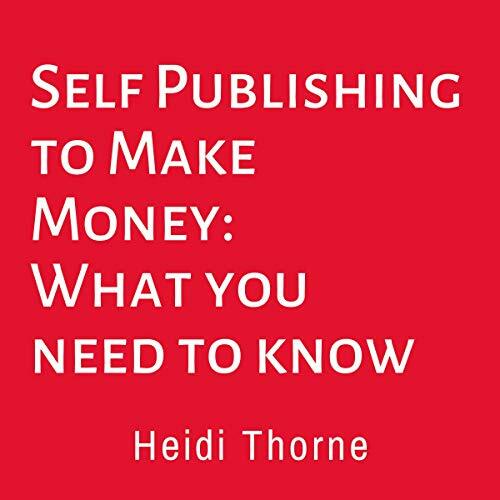 Dr. Heidi Thorne, MBA/DBA, shares her no-nonsense, no-hype insights and observations from her career in publishing as both an editor and author, bolstered by survey research data she’s collected from real self-published authors just like you. Defining what "making money" means for you. What self-published authors really make. How to estimate how many people will initially buy your book. Why it's so hard to sell self-published books (or any books!). Does your choice of self-publishing platform affect your income? Why printing and selling your book on your own isn't a good idea. Why your book cover isn't a "big" deal. What ISBN numbers are and how they can affect your book's sales. How self-publishing could cost you your life savings. Understanding the difference between book "advertising" and "promotion". Learn where and how books are marketed and sold. Using social media and social media advertising for books. An alternative to investing in a domain name and website for your book. Getting more visibility for your book on Amazon. Book advertising and promotions available on Amazon. What self-published authors really want besides money. "Best seller" games you shouldn't play and won't win. The resources for this audiobook, with links to helpful companion resources on the web, are available as a PDF file.